Today I have a special A SMALL CHAT featuring organizing expert (and friend of Oprah), Peter Walsh. 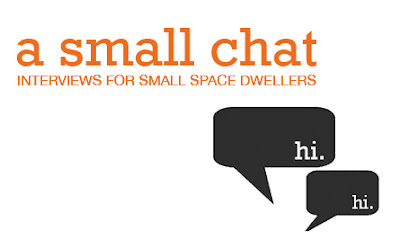 Every small space dweller is looking to keep a styled yet organized and clutter-free home. This can definitely be overwhelming when space is limited. But there are ways to go about making your small home feel bigger and better! Let's hear what Peter has to say about form & function of small spaces, small space tips, editing a small space and more. Living in a small space can be overwhelming and stressful when clutter gets out of control so with a small space it’s imperative to remember that you only have the space you have! I know this sounds odd but I am often hit with the complaint ‘I don’t have enough space!’. Space is fixed, you can’t magically create more and so you need to tailor the amount of stuff you have to fit into the space available. When you move into a small space (or if you’re already there), you must also make a commitment to an organization system that works for you. This is the only way to keep you sane and productive. Once you declutter your living space and develop a system that fits your lifestyle, work, furniture, etc., small spaces can lead to a rewarding, efficient way to live. You just launched a new product line at OfficeMax called “Peter Walsh you.organized.” What are some ways this can be leveraged for small spaces? 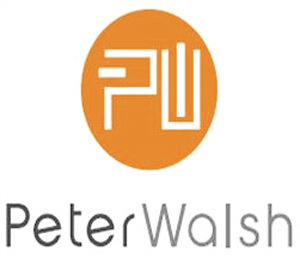 Sure, I designed the “Peter Walsh you.organized” collection with small spaces in mind. With so many people living in apartments and condos or living with roommates, space can really be a commodity, and when it comes to your workspace, you need to be as efficient as possible with space and organization. My new line at OfficeMax includes an all-in-one desk collection that comes with a workspace table, file tray, cord management system, portable bill-paying caddy and storage ottoman that doubles as a seat, paperwork file and even laptop tray! The line also features a console table for additional desktop real estate, and my personal favorite – a system of wall boards that enable vertical organization. 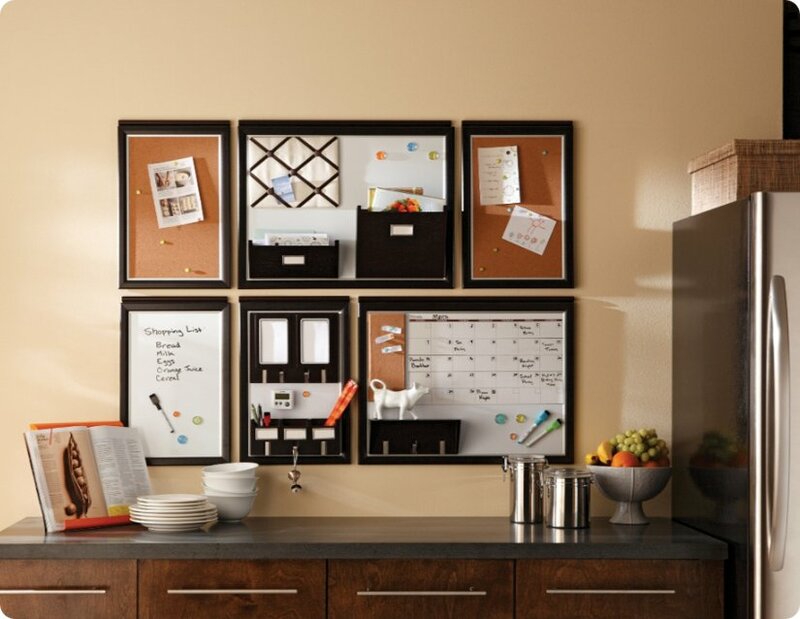 From intuitive calendar boards to cork, ribbon and dry erase, this totally customizable system of boards enable organization without using a lot of space. The wall boards are great in a kitchen environment for the entire household to use, a home office setting, or a small workspace area in your living room or bedroom – you create the configuration best suited to your space. I believe organization is vital to feeling confident and in control of your life and work. Your desk sends a clear signal about who you are and how you approach your work. You should have an organized desk at the start and finish of every day! With that said, I created this collection for OfficeMax with the goal of helping people achieve that peace of mind, reestablish order, and get back in the driver's seat of their work and lives. Oh – and it also looks great! There are tricks to make small spaces appear bigger - such as painting walls cooler colors or using mirrors. Keeping a clean and organized space is also an important one. What are some tips you suggest for people living in small spaces to help them get and stay organized without it feeling overwhelming? Having clean and organized areas certainly makes a smaller space appear larger. If you’ve let things slide and are looking to take back control, you need to first consider your situation and decide what you need to purge and what simply needs a dedicated “home.” Once you purge unwanted items (and donate or recycle what you can), group like items together and identify locations for storage. You may need to purchase storage bins, desktop organizers, mail bins, key holders and so on to setup an effective home organization system. Clearly label all of these items, so the entire household understands their purpose and can easily and quickly locate them. Once your home is organized, the trick is to maintain this on a daily basis. Leave nothing till ‘later’ but rather put things away when finished with them or complete even the smallest of tasks. At first, you need to retrain the way you think about every jacket, pair of shoes, piece of paper, keys, etc. as having a “home” or dedicated space. For example, stop yourself when you start to dump your mail on the kitchen counter and instead put it in your mail tray. Once you get the hang of your new system, it will become automatic, you’ll feel more in-control, efficient and aware of the items in your home and - best of all – you’ll find that clutter doesn’t suddenly appear and take over your space. Many small space dwellers have one main room that needs to play double or even triple duty (living room? check. dining room? check! office? check!) What are your thoughts on making a multi-functioning room effective for each function? In a multi-purpose room, create zones within the room that are dedicated to each specific task. Try to make this area totally dedicated to the desired function and avoid distractions. For example, if you’re creating a workspace in your living room, place your desk facing away from the TV, keep your desktop clean and dedicated to your work items ONLY, and use the wall space for organization and to-do lists. I would also suggest using furniture that has multi-purposes, such as a chest that is used as a coffee table and offers storage space inside. Small spaces can work incredibly well but they take care to set up and discipline to maintain. The rule of thumb is ‘Does this item help me create the space I want?’ When it comes to furniture and décor items, there is definitely a time to get rid of pieces that have outlived their usefulness, are not being used or don’t match your home décor anymore. Because furniture and décor items can be more expensive than clothing, people often want to keep these items despite their lack of functionality or purpose. But if they are not contributing to your space, you should consider selling them at a garage sale or giving them to a friend or thrift store. Also, in small spaces, any item of furniture that doesn’t serve multi-functions is likely not to contribute to the most efficient use of the space. Be careful before introducing new items – carefully think through how you’ll use them and how they will compliment what you already have in the space. I love the idea of layering furniture in small spaces and placing furniture in front of other pieces to create dimension and utilize the footprint. That being said, sometimes I feel like my small space is, well, too small. Can you offer advice for helping small space dwellers reboot mentally to gain perspective and begin bringing order back into their space? No matter which space in your home, design, décor and organization should work together hand-in-hand. All too often, people think of style and décor but forget the functionality and organization side of a room. To gain perspective, try to engage a fresh pair of eyes from a friend or organization expert to offer feedback about your space. You can also snap a few photos and print them out for review. Try to think objectively about what you want the room to achieve and how each element in the room adds to this goal. If something is not contributing to your vision, you may want to consider finding a new piece to take its place or removing it out all together. By thinking objectively and working toward an end goal, you can start streamlining your space that will help you achieve what I like to call, organizational bliss! Check out Peter's design site, Peter Walsh Design, and Peter's new product line at Office Max, Peter Walsh you.organized.